Posted on Fri, Jan 13, 2012 : 7:57 p.m.
Senior captain Mike Martin on J.T. Floyd, above, who along with quarterback Denard Robinson announced they'd return to Michigan for their senior seasons: "He had a pretty good season this year, but he has so much room to improve and get better." 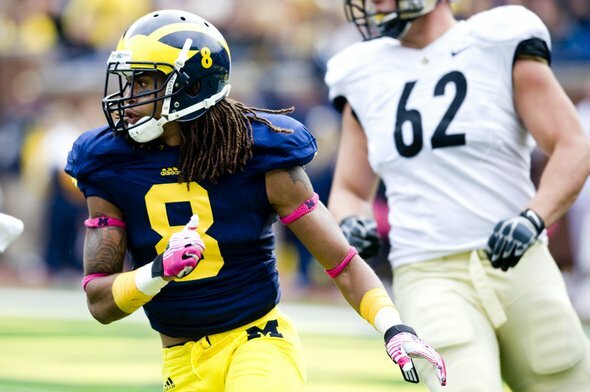 Mike Martin is glad quarterback Denard Robinson and cornerback J.T. Floyd elected to return to the Michigan football team because they can take care of what he never could. Beat Michigan State and win a Big Ten championship. "Those guys, they have unfinished business," Martin said in an interview Friday. "I wish I could be a part of it, but I was a part of taking a huge step closer to it and they just got to tie up the loose ends -- and that’s something they want to do, and know they have to do. "They’re not going to let us down, and I think Coach (Brady) Hoke is going to have a hell of a second season at Michigan." The Wolverines announced Friday afternoon that Robinson and Floyd, juniors who were having their pro stock evaluated by the NFL Draft advisory board, will return next year. The board's feedback is not made public, but it's likely neither Robinson nor Floyd received high-round grades. Robinson rushed for 1,176 yards and 16 touchdowns last year to help lead Michigan to an 11-2 record and Sugar Bowl win against Virginia Tech. By returning, he could be primed to set the Big Ten and NCAA all-time quarterback rushing records. However, the senior-to-be has yet to find consistency in the passing game. He finished 142-of-258 passing for 2,173 yards and 20 touchdowns last season. He threw 15 interceptions, sixth most in the country. There clearly is room for improvement, especially considering Robinson remains steadfast in his desire to become a quarterback at the next level. For that reason, Martin and fellow outgoing captain Kevin Koger said Robinson never was close to leaving school. "He may have considered leaving, but I always had the feeling he was going to stay," Koger added. "It doesn't surprise me that he came back. Not at all. It would have surprised me if he left." Koger and Martin also said Floyd made the right call in holding off on the NFL for another year. The cornerback had 48 tackles, eight pass breakups and two interceptions last year. "He had a pretty good season this year, but he has so much room to improve and get better," Martin said. "He dodged the injury bullet a lot better this year. I’m happy for him on that. If he stays healthy, he’s going to have a great season." Koger is expected to play in the East-West Shrine Game on Jan. 21. Martin will play in the Senior Bowl on Jan. 28, then participate in the NFL Combine from Feb. 22-28. Center David Molk is expected to join him at the combine. Michigan's pro day will be held on campus March 15. Mon, Jan 16, 2012 : 6:51 p.m. Sat, Jan 14, 2012 : 9:50 p.m.
@AAROX, We haven't beaten MSU in 4 years, so that does sound like an acceptable goal. We beat OSU this season so that goal has been met, and downing Sparty would feel, oh so good! By ignoring or not acknowledging that MSU is better than us will not prove that they are not our rivals, it will only prove that we are fooling ourselves about the two programs. We must earn back our respect and start dominating the again! Sat, Jan 14, 2012 : 7:39 p.m.
Roy Roundtree has already stated the team goal for next year. &quot;win at least 10 games, and win the B1G&quot;. Really that's the goal? so he's cool with loosing three games? Which ones would those be? Mon, Jan 16, 2012 : 5:40 a.m. Sat, Jan 14, 2012 : 3:12 p.m. Sat, Jan 14, 2012 : 6:06 p.m.
Umm... to win the big 10 championship, they will have to beat the spartans. Your pretend apathy is getting ahead of your logic. I'd sat Denard leaving would improve UofM's chances of beating MSU... but what-evs. Sat, Jan 14, 2012 : 4:01 p.m. Sat, Jan 14, 2012 : 10 a.m. Sat, Jan 14, 2012 : 9:58 a.m. Sat, Jan 14, 2012 : 4:35 p.m.
keepingit do you know something most other folks know when you say that &quot;DR will be a huge asset to any pro team next year.&quot; That is not my opinion nor is it the conventional wisdom. Even Kyle says, &quot;The board's feedback is not made public, but it's likely neither Robinson nor Floyd received high-round grades. The senior-to-be has yet to find consistency in the passing game. He threw 15 interceptions, sixth most in the country. There clearly is room for improvement&quot; What are you seeing that the rest of us are having trouble seeing? Sat, Jan 14, 2012 : 2:54 p.m. If these players we to have gone pro this year, they probably would have made more in one year than the average college graduate makes over a ten year period. DR will be a huge asset to any pro team next year as will Floyd. I just hope they have taken out an insurance policy that will cover them if injury should end their career because I guarantee you, not one Michigan fan will give a hoot about them if they are unable to play and their career ends. Its a business. Sat, Jan 14, 2012 : 11:43 a.m. I totally agree. Stay in school,graduate.Then you will have more options.Pro careers are short term. Sat, Jan 14, 2012 : 3:06 a.m.
iam glad they are both coming back and they both will have a great senior season. . . i hope DG get's more reps next season we will also need him. yes it is great to be a MICHIGAN WOLVERINE!!! GO BLUE!!!!!!!!!! Sat, Jan 14, 2012 : 1:56 a.m.
Well that's good and expected. Now it's time for Hoke &amp; Staff to wrap up that great recruiting class, which will be the 1st in a line of great recruiting classes every year like it used to be and I mean at least top 10 if not a top 5 class every year, after all this is Michigan! Then we can anticipate the Spring Practice Season and continue the resurgence of the GREAT U-M Football Program! It's so great to be a Michigan Wolverine!! !